VIENNA-U.S. Secretary of State John Kerry is meeting separately with his Iranian and Russian counterparts in Vienna, before international talks on Syria the top U.S. diplomat has called "the most promising" opportunity in years to end the country's bloody conflict. U.S. Secretary of State John Kerry meets with Iranian Foreign Minister Javad Zarif in Vienna, Austria, October 29, 2015. In addition to one-on-one talks with Iran's Mohammad Javad Zarif and Russia's Sergei Lavrov, Kerry is taking part in informal meetings Thursday on Syria with senior diplomats from Russia, Saudi Arabia, Turkey, Austria and the EU. “We’ll see what happens,” said Kerry, as he headed into a session with Austrian Foreign Minister Sebastian Kurtz. Kurtz laid out the challenges the diplomats are facing. On Friday, the meetings aimed at ironing out differences over the fate of Syrian President Bashar al-Assad will expand to include representatives from other nations. The talks notably will not include members of either the Syrian government or the main groups trying to overthrow it. Syrian National Coalition member Mwafaq Nairabiye warned that Iran would hamper efforts to reach a political resolution because of its support of Assad. In a Wednesday meeting with a French parliamentary delegation, Assad said that many regional and Western countries, including France, are providing support to armed terrorist groups in Syria. The Syrian leader frequently has referred to Syrian opposition groups as terrorists. 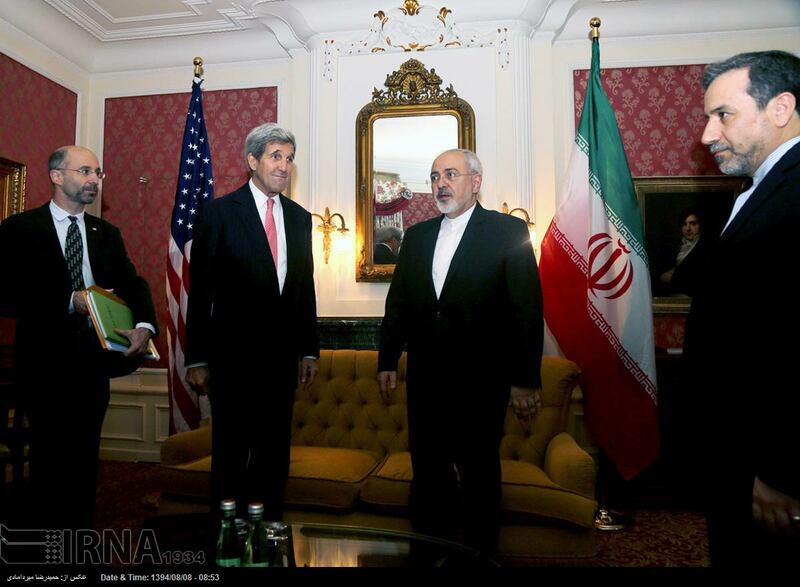 Nonetheless, Kerry on Wednesday expressed optimism the talks appear to be the best way to reach an eventual peace. "While finding a way forward on Syria will not be easy, it's not going to be automatic, it is the most promising opportunity for a political opening we have seen," Kerry said, speaking at the Carnegie Endowment for International Peace. Rattling off the statistics, one in 20 Syrians has been wounded or killed, one in five is a refugee, Kerry said. "My friends, the challenge we face in Syria today is nothing less than to chart a course out of hell." Kerry said the United States is taking a two-pronged approach to Syria. One is the diplomatic route, as exemplified by this week's negotiations. The second prong is intensifying the counter-Islamic State campaign being conducted by a U.S. led coalition. Kerry said the coalition will be resupplying moderate fighters in northern Syria, enhancing its air campaign and beginning to put pressure on Islamic State strongholds in the city of Raqqa. On Wednesday, U.S. lawmakers questioned the prospects for progress in multi-national talks about Syria's political future, considering the gaps between the U.S. position and the views of Russia and Iran. "It is hard to square ... the facts on the ground with the potential for some grand diplomatic solution," Senator Bob Corker said during a Capitol Hill hearing on U.S. Middle East strategy. Corker cited Russia's continued airstrikes against the Syrian opposition, including some opposition groups that receive U.S. support, as a key reason for his skepticism. He also noted Iran and Russia's efforts in support of Syrian President Bashar al-Assad, who has been the focal point of the four-year cycle of bloodshed in Syria. After the hearing, Corker told VOA's Deewa Service that while the United States has seen some "breakthroughs" recently in the fight against the Islamic State, such as use of military bases in Turkey, more needs to be done. "At some point there has got to be a willingness by our Arab friends and others to be much more on the ground," said Corker. "But that is not where we are in Syria," he added. At the Senate hearing, General John Allen told lawmakers the crisis in Syria is one of the most complex situations he has seen in his military career. Allen is a retired Marine Corps general who is special U.S. envoy assigned to counter the activities of Islamic State militants in Syria and other countries. Corker asked Allen if the Obama administration could envision a situation in which Russian military units in Syria would focus exclusively on Islamic State targets in the country, and exclude other Syrian opposition groups from their airstrikes. General Allen replied "no", because Russia's overall goal in Syria is to "stabilize" President Bashar al-Assad by fighting the opposition elements that pose the greatest threat to his regime. U.S. diplomats do not expect a definitive conclusion to the talks this week, considering that Russia and Iran have been closely aligned with the Assad regime, while the United States and other Western powers have backed the moderate Syrian opposition. Instead, the United States expects there will be further rounds of meetings about Syria's political future. Vienna is the first stop for Kerry on a trip that also will take him to Central Asia: to Bishkek in Kyrgyzstan; Samarkand, Uzbekistan; Astana, Kazakhstan; Dushanbe, Tajikistan; and Ashgabat, Turkmenistan. Ayaz Gul in Islamabad and a number of VOA reporters contributed to this report.